1. 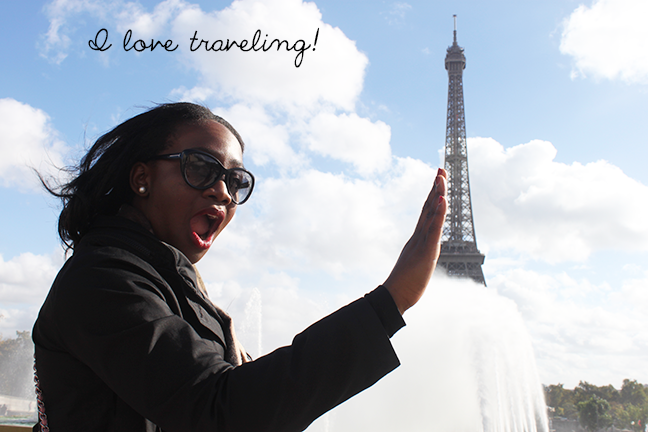 Where do you currently reside and what do you love most about it? 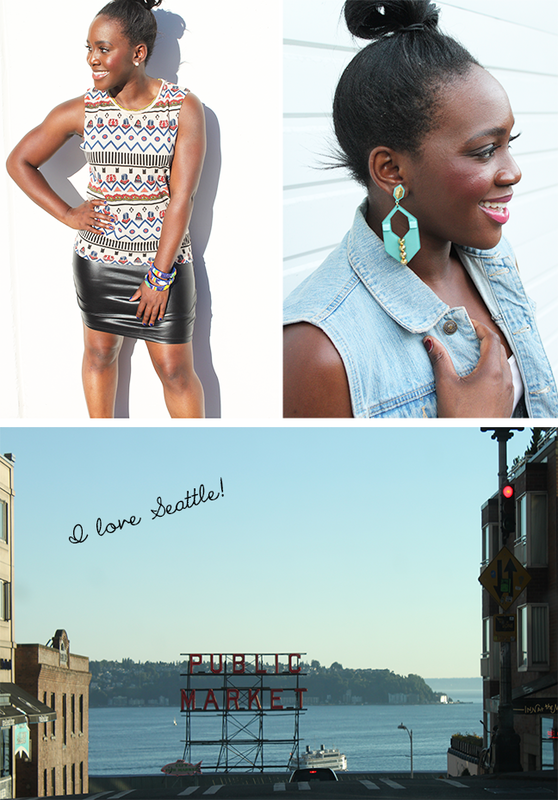 "I live in sunny (just joking) Seattle and I love EVERYTHING about it. Seattle offers you everything from Starbucks to hipsters, to the mountains, water, city-life, and so much more. P.S. It doesn't rain as much as people claim…it honestly just sprinkles. No one uses their umbrella! Did I mention we have an amazing football team too? 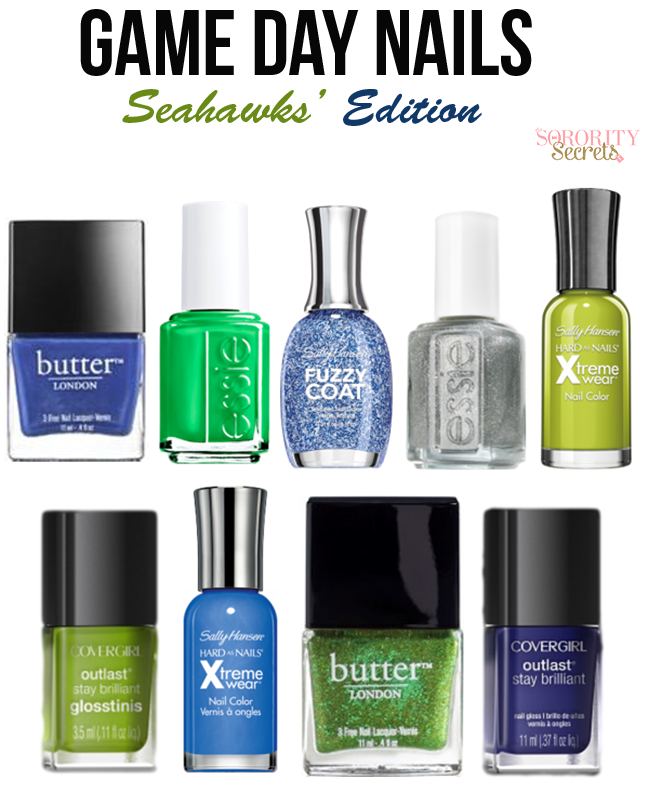 GO SEAHAWKS!" 2. Describe your closet. "Well, I have two closets because I am a shoe and clothes fanatic. My walk-in closets are filled with clothes that are all color coordinated and shoes for days. My style is so eclectic that you see everything from a leopard Forever 21 jumpsuit to sparkly Louboutin heels!" 3. What was your favorite part about being in a sorority? " I absolutely loved choreographing and performing dances for philanthropies. Our dance group (which included Co Founder, Sakura!) called ourselves The Thetawockeez--it was great!" 4. What did sorority life teach you that you applied in the real world? "Sorority life taught me to show people the greatest version of you. You want everyone, whether they are compatible with you or not, to fall in love with who you are. This is one of the biggest lessons that my sorority taught me that I have applied in every aspect of the real world". 5. 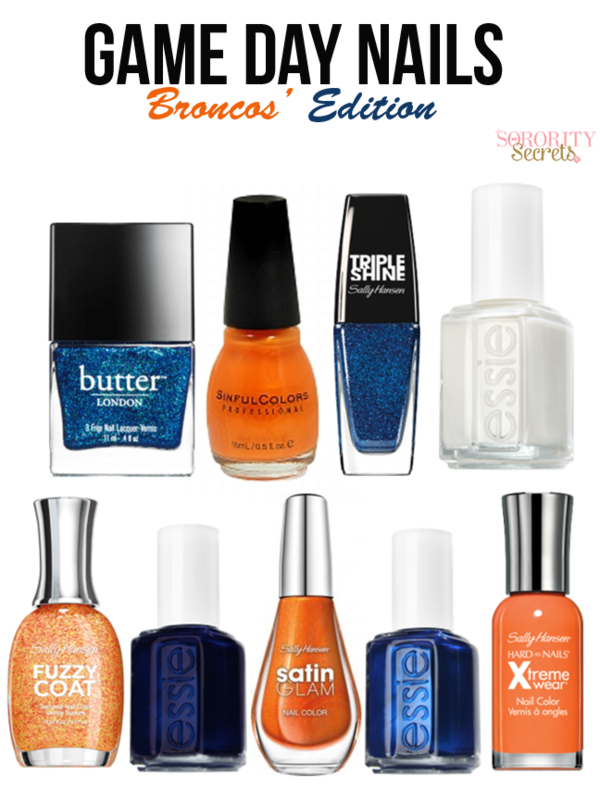 What are 5 beauty products you can't live without? "Lipgloss (Victoria's Secret lipgloss will always be my fave but I have recently started using Smashbox Lipgloss and it is equally amazing), Bare Minerals Foundation powder, Lilly Lashes, MAC Comfort Creme, and my favorite sets of perfumes that I rotate (Angel by Thierry Muglier, Coco Mademoiselle by Chanel, Bright by Versace and La Vie Est Belle by Lancome)". 6. 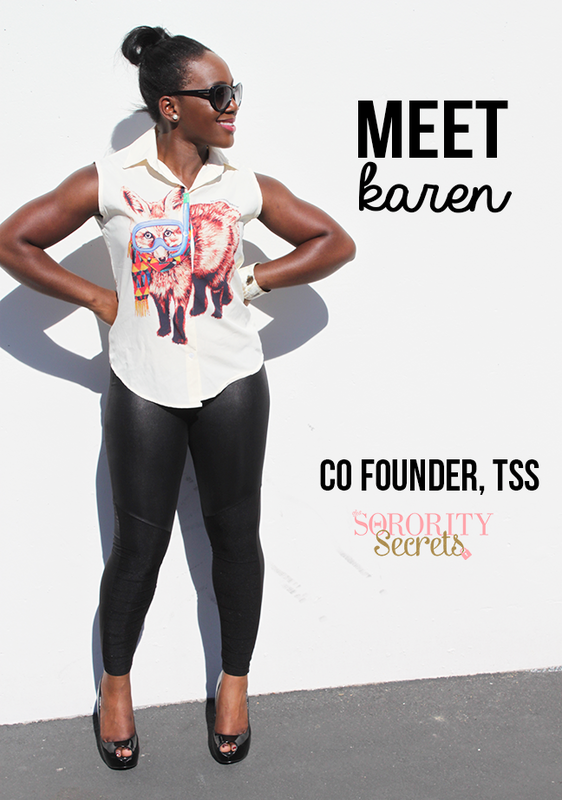 What do you love most about working on TSS? "I love seeing the reaction our readers have to our content. It is so inspiring to watch and hear how much our content improves lives!" 7. What is the best advice you were ever given? "Be careful how you treat people on your way up because you might meet them on your way down". Those are famous words from my mother and they couldn't be more true. Often times in life, people gain a level of success where they forget where they came from or how they got there and choose to mistreat those who were on their journey. Lack of humility and self-entittlement can really hinder your reputation with people who have known you so it's so important to remain humble and avoid burning bridges. After all, you never know, you might see these same people again and the tables could turn where you will need their help". 8. Who's your celebrity style crush? "My STYLIST crush ( I say Stylist crush because we all know celebrities do NOT dress themselves) is Monica Rose. She styles women like the Kardashians and Guiliana Rancic to name a few and I absolutely love every look she puts together. I would love to raid her closet!" 9. What are your top 3 stores you like to shop at? "This is a toughy but I would have to go with TOPSHOP, ZARA, and FOREVER 21. If I can sneak one more in I would say my favorite online store is ASOS". 10. What do you like to do on your day off? No days off here folks! Haha, just joking…sort of. On my day off I like to have friends over where we enjoy a glass of champagne and catch up on reality TV! 11. What else do you do for work? When I am not blogging, I am working full time in medical sales. I love working for a company that is essentially saving and improving lives! 12. What are your interests/passions? I absolutely LOVE party planning. It is my true passion and I really look up to party planners like Colin Cowie and Mindy Weiss. My specialty is candy buffets which I do here and there for my friends and people who reach out to me. I started documenting my parties and party advice here. With the Playoffs underway and Superbowl around the corner, if you're lost whenever you flip the channel to ESPN and you see a game of football, we've decided to put together some basic football knowledge to help you sound semi-cool in front of your significant other or a group of football lovers. It really is fun to get into the game when you understand calls that the refs are making and the overall nature of the game! So today, let's start with learning the basics. 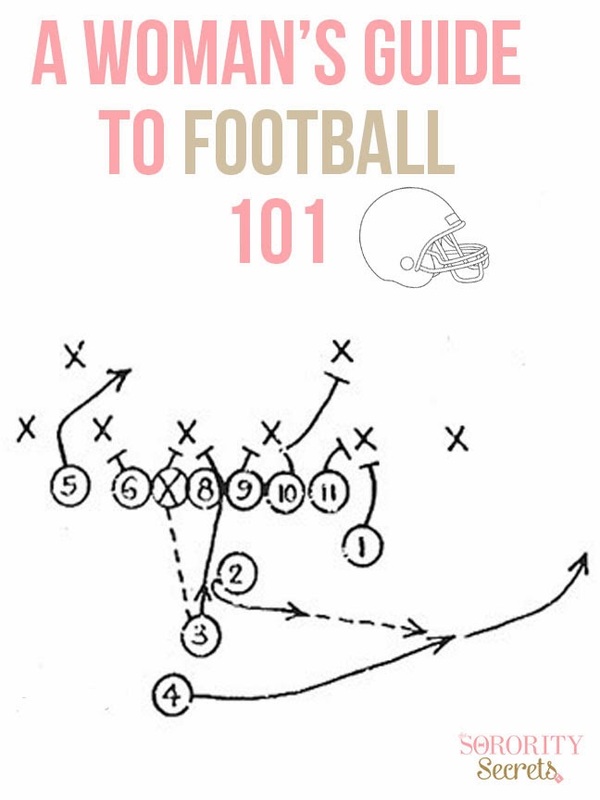 This women's guide to football is adapted from NFL.com's rulebook section so check it out for more detailed information. Each team has 3 separate units: the offense, those players who are on the field when the team has possession of the ball; the defense, players who line up to stop the other team's offense; and special teams that only come in on kicking situations (punts, field goals, and kickoffs). Only 11 players are on the field from one team at any one time. This is an 11-man team that has possession of the ball. They try to advance the ball down the field to the end zone in order to make a touchdown and score points. This is another 11-man team that does not have possession of the ball and instead is trying to stop the offensive team from making a touchdown. In other words, they are trying to make them give up possession of the ball. Games are divided into four 15-minute quarters, separated by a 12-minute break at halftime. There are also 2-minute breaks at the end of the first and third quarters as teams change ends of the field after every 15 minutes of play. At the end of the first and third quarters, the team with the ball retains possession heading into the following quarter. That is not the case before halftime. The second half starts with a kickoff in the same way as the game began in the first quarter. Each offensive team has 40 seconds from the end of a given play until they must snap off the ball for the start of the next play, otherwise they will be penalized. The clock stops at the end of incomplete passing plays, when a player goes out of bounds, or when a penalty is called. The clock starts again when the ball is re-spotted by an official. A game starts with the kickoff. The ball is placed on a kicking tee at the defense's 30-yard line, and a special kicker (a "placekicker") kicks the ball to the offense A kick return man from the offense will try to catch the ball and advance it by running. Where he is stopped is the point from which the offense will begin its drive, or series of offensive plays. When a kickoff is caught in the offense's own end zone, the kick returner can either run the ball out of the end zone, or kneel in the end zone to signal a touchback - a sign to stop the play. 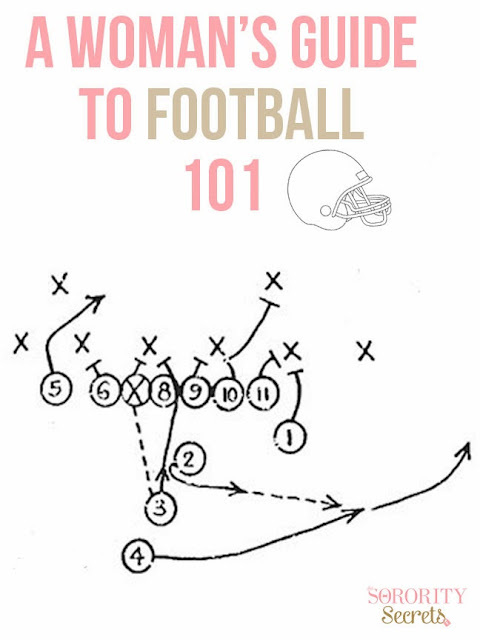 The ball is then placed on the 20-yard line, where the offense begins play. All progress in a football game is measured in yards. The offensive team tries to get as much "yardage" as it can to try and move closer to the opponent's end zone. Each time the offense gets the ball, it has four downs, or chances, in which to gain 10 yards. If the offensive team successfully moves the ball 10 or more yards, it earns a first down, and another set of four downs. If the offense fails to gain 10 yards, it loses possession of the ball. The defense tries to prevent the offense not only from scoring, but also from gaining the 10 yards needed for a first down. If the offense reaches fourth down, it usually punts the ball (kicks it away). This forces the other team to begin its drive further down the field. A play begins with the snap. At the line of scrimmage (the position on the field where the play begins), the quarterback loudly calls out a play in code and the player in front of him, the center, passes, or snaps the ball under his legs to the quarterback. From there, the quarterback can either throw the ball, hand it off, or run with it. There are two main ways for the offense to advance the ball. The first is called a run. This occurs when the quarterback hands the ball off to a running back, who then tries to gain as many yards as possible by eluding defensive players. The quarterback is also allowed to run with the ball. The other alternative to running the ball is to throw it. Or as they say in football, pass it! Usually, the quarterback does the passing, though there are times when another player may pass the ball to confuse the defense. Actually, anyone on the offensive team is allowed to pass the ball as long as the pass is thrown from behind the line of scrimmage. A pass is complete if the ball is caught by another offensive player, usually the "wide receiver" or "tight end." If the ball hits the ground before someone catches it, it is called an incomplete pass. The defense prevents the offense from advancing the ball by bringing the ball carrier to the ground. A player is tackled when one or both of his knees touch the ground. The play is then over. A play also ends when a player runs out of bounds. A touchdown is the biggest single score in a football game. It is worth six points, and it allows the scoring team an opportunity to attempt to get an extra point. To score a touchdown, the ball must be carried across the goal line into the end zone, caught in the end zone, or a fumble recovered in the end zone, or an untouched kickoff recovered in the end zone by the kicking team. where the offense has two options. Usually the offense will kick an extra point, also called the point after touchdown, conversion, or PAT. If the offense successfully kicks the ball through the goal posts, it earns one point. The offense can also score two points by running or throwing the ball into the end zone in the same manner as you would score a touchdown. Since going for two points is more difficult than kicking an extra point, the offense generally chooses to kick the extra point. If the offense cannot score a touchdown, it may try to kick a field goal. Field goals are worth three points and often are the deciding plays in the last seconds of close games. They can be attempted from anywhere on the field on any down, but generally are kicked from inside the defense's 45-yard line on fourth down. For a field goal to be "good", the placekicker (or field goal kicker) must kick the ball through the goal-post uprights and over the crossbar. The defense tries to block the kick and stop the ball from reaching the goal post. The safety is worth two points. A safety occurs when the offensive ball carrier is tackled behind his own goal line. When the ball carrier or passer drops the ball, that's a fumble. Any player on the field can recover the ball by diving on it or he can run with it. The team that recovers a fumble either gets-or retains-possession of the ball. An aggressive defense can regain possession of the ball by catching (intercepting) passes meant for players on the other team. Both fumble recoveries and interceptions can be run back into the end zone for touchdowns. We hope this was helpful and that you can now "talk football"!